Iron-On stickers can be fixed to your clothes with the heat of your iron. For garments that will be washed frequently, it is recommended to also sew a few stitches. Product Description: Iron-on sticker with a design of a picture with colorful flowers. Content: 1 sticker. Maximum Length: 70 mm. Material: Textile. Product Description: Iron-on sticker with a design of a multicolor flower. Content: 1 sticker. Maximum Length: 68 mm. Material: Textile. Product Description: Sticker with a design of a rabbit and bugs in soft pastel colors.Content: 1 iron-on sticker .Maximum Length: 58 mm.Material: Textile. Product Description: Iron-on sticker with a design of a little bear.Content: 1 sticker.Maximum Length: 39 mm.Material: Textile. Product Description: Sticker with a design of two kitties with soft pastel colors.Content: 1 iron-on sticker .Maximum Length: 80 mm.Material: Textile. Product Description: Sticker with a design of two little bears in soft pastel colors. Content: 1 iron-on sticker . Maximum Length: 65 mm. Material: Textile. Product Description: Sticker with a design of two little bears in soft pastel colors. Content: 1 iron-on sticker . Maximum Length: 80 mm. Material: Textile. Product Description: Sticker with a design of two rabbits in soft pastel colors.Content: 1 iron-on sticker .Maximum Length: 75 mm.Material: Textile. Product Description: Sticker with a design of two little bears.Content: 1 iron-on sticker .Maximum Length: 70 mm.Material: Textile. Product Description: Sticker with a design of a honey pot and two bees. Content: 1 iron-on sticker . Maximum Length: 60 mm. Material: Textile. 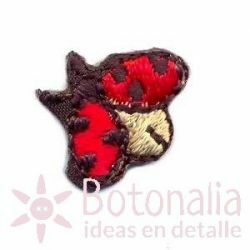 Product Description: Sticker with a design of a ladybug. Content: 1 iron-on sticker . Maximum Length: 15 mm. Material: Textile. 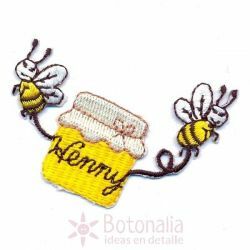 Product Description: Sticker with a design of a bee.Content: 1 iron-on sticker .Maximum Length: 24 mm.Material: Textile.